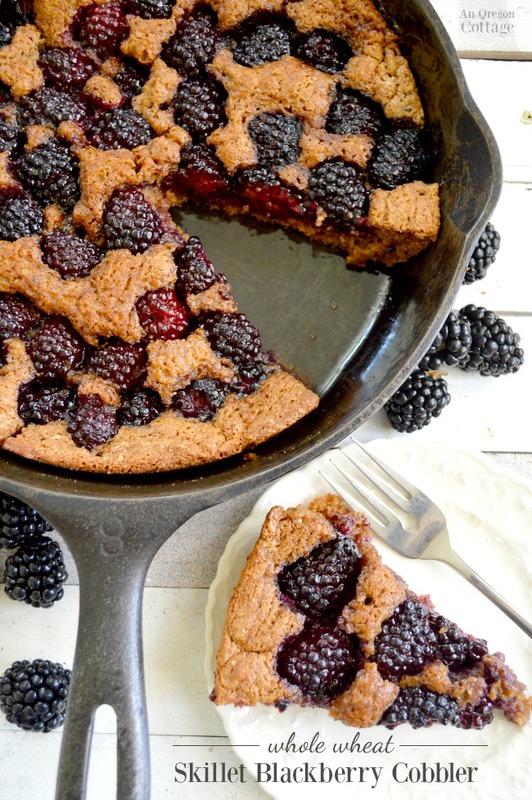 Whole Wheat Skillet Blackberry Cobbler- a delicious pour-in-pan, 10-minute prep, healthy lower sugar dessert to showcase seasonal berries. Perfection with a scoop of vanilla ice cream! Find more Quick Healthy Recipes here. Living in Oregon, there are a number of things we’re known for: rain, green, and beautiful scenery come to mind. We’re also more and more known as “foodies” with craft beers, specialty chefs, and food carts. There are also some foods that we’re known for, too, like blueberries, hazelnuts, and my favorite – blackberries. While we may also be know for ducks (go UO!) I don’t have any desire to roast a duck! 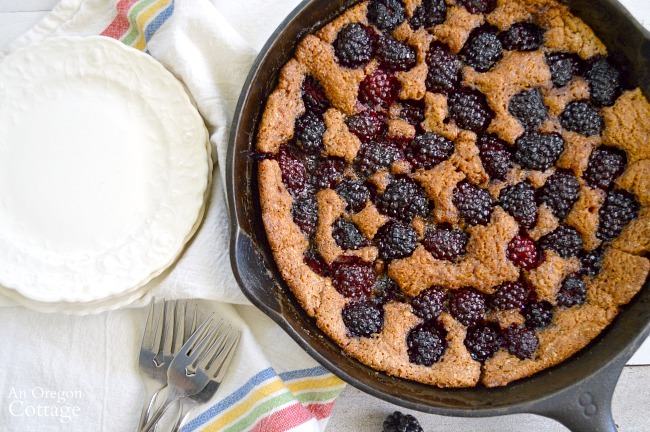 So what better way to highlight the delicious Oregon blackberry than with an easy cobbler that’s not only a wonderful dessert, but a healthier dessert, too. Blackberries grow wild not only in western Oregon, but all up and down the mild Pacific Northwest areas. The wild ones are prolific (and weedy!) but our climate is also perfect for developing named varieties, too, like Marionberries, Boysenberries, and more. We can thank Oregon State University for many of the best blackberry varieties. Between the wild berries and the hybrids you can harvest blackberries in Oregon from early June through August, and sometimes into September, depending on our summer weather. That’s a lot of blackberries. 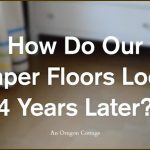 And we’ve got to use them up, right? 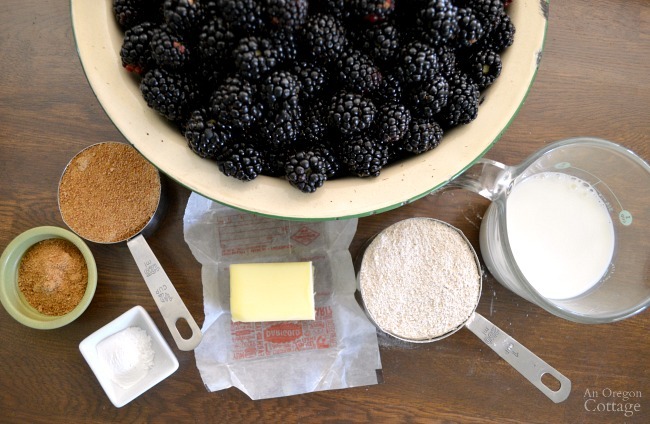 So to our list of blackberry freezer jams, whipped cream parfaits, big-crumb berry crisps, whole wheat crumb bars, and low-sugar berry syrup, I’d like to present this fantastic way to eat blackberries – as a crispy whole wheat blackberry cobbler. 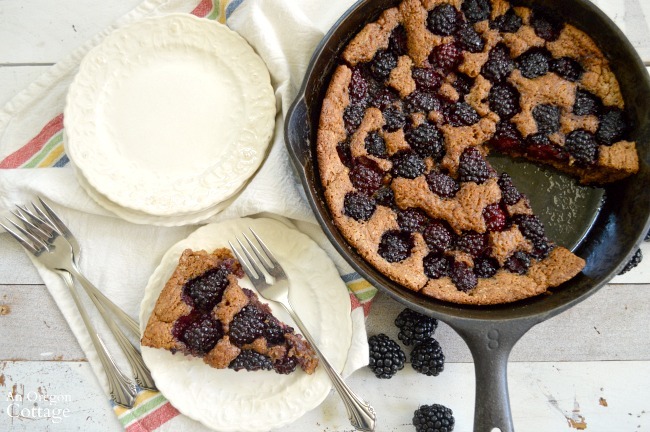 As you can see, the batter only just holds the berries together and the buttery, slightly sweetened crust serves to highlight the wonderful flavor from the berries. The other thing that’s amazing about this cobbler – really amazing – is that it takes about 10 minutes to prepare (and probably less) because you just pour everything in the skillet (or baking pan) and set it to bake. So a seasonal dessert – or breakfast cake – with less than 10 minutes work and just six ingredients? Love it! 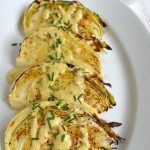 It’s almost a one-pan recipe, but for a quick mix of the dry and wet ingredients in a small bowl while the butter is melting in the skillet. 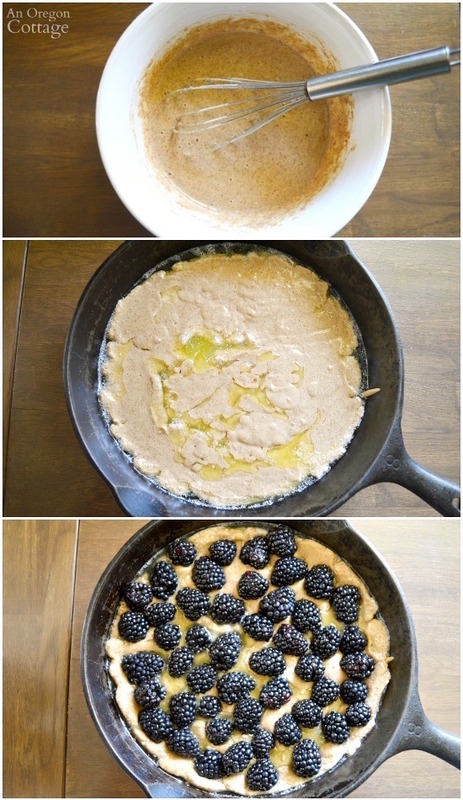 Once the butter’s melted, pour the batter on top and then add a layer of fresh blackberries. Top with a dusting of sugar and bake. Yep, less than 10 minutes once you get the hang of it. Can’t you just imagine warm berry cobbler on a Saturday morning with coffee? If you’re wondering what type of berry I used in these photos, they are my new favorite that produces berries for more than a month for us in the summer, Triple Crown Thornless. Huge berries + easy picking + incredible flavor = heart eyes. 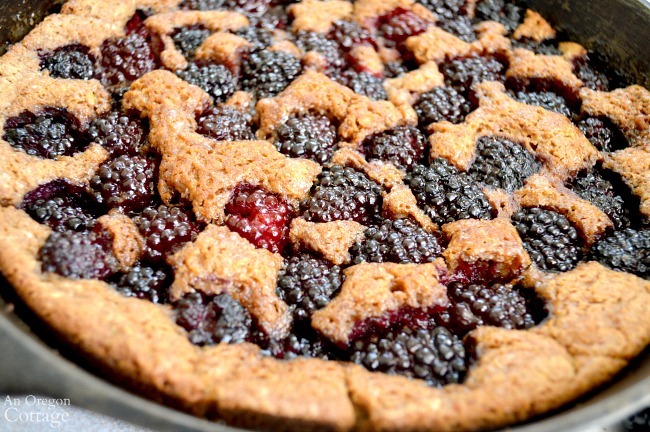 Click the arrow for the printable Skillet Blackberry Cobbler recipe!